The transcript of former Prime Minister’s optimistic and visionary presentation is below. FOS hopes you will enjoy it as much as his audience did at the lecture itself. 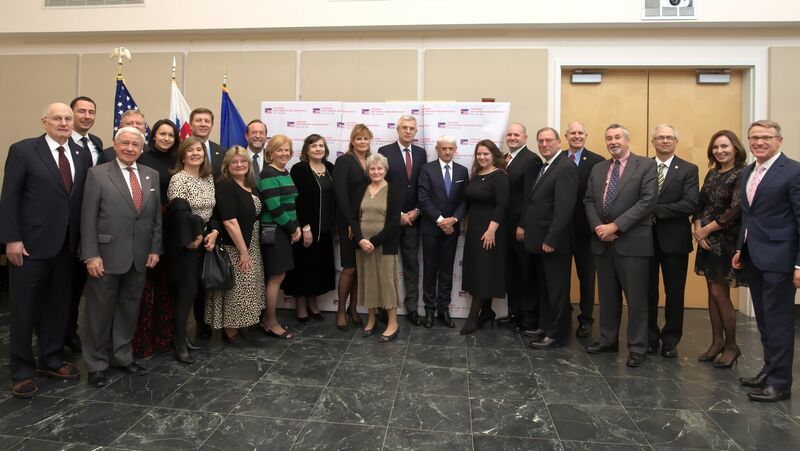 Ladies and Gentlemen, let me please begin by extending my warm thanks to the Friends of Slovakia for the invitation to deliver the 2018 Czech and Slovak Freedom Lecture here, at the Woodrow Wilson Center. My special thanks go to Mr. Theodore E. Russell, the Founding Chairman of the Friends of Slovakia and the first US Ambassador to Slovakia. I also want to greet all of you, the friends of Slovakia and of the Czech Republic here in the United States. Our today’s theme will be Slovakia, including Slovakia in the Czechoslovak context, since we are remembering not only the 25th anniversary of the Slovak Republic but also the 100th anniversary of the birth of the Czechoslovak Republic. During my years in politics I quite often appeared in the United States side by side with the Czech political representatives. Thus, during a NATO summit, I was invited by President Havel to attend a gala evening dedicated to the Czech Diaspora. Together with Miloš Zeman as the then Czech Prime Minister, we commemorated the 10th anniversary of the fall of the Berlin Wall at the White House on invitation by President Clinton. Our embassies organized numerous joint events, especially thanks to excellent cooperation between Ambassadors Martin Bútora and Alexandr Vondra. Remembering those events and the road that our two nations travelled during the last one hundred years evokes pleasant and intense emotions. Dear friends, when I look back at the road that the Slovaks and the Czechs travelled over the past 100 years, I am tempted to use the words of Václav Havel: I am not sure that I know what a miracle is. Having said that, I dare say that what we, the Czechs and the Slovaks, have overcome and achieved on this road is a real miracle. Despite the consequences of World War One, despite all the growing pains of the young post-war Czechoslovak Republic, despite all the indignities we suffered in World War II, despite the horrors of Fascism and Communism, despite brutal normalization following the 1968 invasion, despite the difficulties of the transformation period after the Velvet Revolution, despite the dissolution of the common state and creation of independent Slovak and Czech Republics, despite of all that here we are today – the Slovaks and the Czechs – equal, fully emancipated members of NATO, the EU, and of the entire developed international democratic community. Slovakia and the Czech Republic are open countries with rising living standards of their citizens. Our countries enjoy the respect of the world around us. I admit that we have not always walked side by side at the same pace or in the same direction. On the Slovak side, we have caused our road to be somewhat bumpy. This was especially true of the period that followed the demise of Czechoslovakia. While the Czechs pursued reforms, modernization and transformation, Slovakia was on the verge of a relapse. So much so that Madeleine Albright called Slovakia a black hole of Europe in 1997. While the Czech Republic, Hungary and Poland joined NATO in 1999, Slovakia was excluded from integration processes. Shortly after successful 1998 elections, just around the time when our neighbors were being admitted to NATO, I paid my first visit to the US President. As the meeting drew to a close, I appealed to President Clinton to give Slovakia another chance. President Clinton’s answer was that we missed the train and that we stayed alone. I argued that NATO membership was also sought by the Baltic States: Lithuania, Latvia and Estonia. The President replied: “Russia would never allow it!” But five years later, on March 29, 2004 Slovakia entered NATO together with the Baltic States, Romania and Bulgaria. And I had the honor to deliver an address on behalf of the new member states standing on the White House lawn next to President Bush. Wasn’t that a miracle? Yes, after the 1998 elections Slovakia embarked on a difficult reform path. The demise of the Communist bloc and of the Soviet Union led also to the collapse of Slovakia’s huge arms industry. Mines were being closed down, and big steelworks in the Eastern part of the country employing over 20,000 people was facing bankruptcy. At its peak, the unemployment rate climbed to 20 % and in some regions to as high as 30 %. Our foreign exchange reserves were close to zero. Before the 1998 elections, our finance minister was borrowing money at a 28 % interest. Slovakia suffered from a democratic deficit, the raging of mafia, the lack of foreign investments – in short, it was economically devastated. However, not later than after five years of painful but exceptionally successful reforms The New York Times called Slovakia in 2004 the economic tiger of Europe. The American US Steel Corporation turned the Slovak steelworks into the most advanced facility of the company. Slovakia makes no tanks anymore, but it is the largest per capita manufacturer of passenger cars in the world. The unemployment rate fell below 6 %. Isn’t that a miracle? Ladies and Gentlemen, the Slovaks and the Czechs have a reason to be proud. In particular, we can be proud of our resilience and endurance. But also of the faith that helped us get through the most difficult moments. We had great political personalities in our history, such as presidents Masaryk and Havel on the one side, and Štefánik and Hodža on the other. Moreover, we were able to draw support from such spiritual figures as Cardinals Beran and Tomášek on the one side and Cardinal Korec and Bishop Gojdič on the other. It was also thanks to these people that we dared dreaming. When President George Bush Sr. visited Prague on November 17, 1990 – one year after the Velvet Revolution – I was moved. But I was also a little sad. Because his trip did not include Bratislava. Although I barely touched politics at that time, I remember that I hoped to see an American president one day also in Slovakia. It still seems like a dream: less than 15 years after his father’s visit to Prague as President of the United States, Bratislava saw the visit of President George Walker Bush! As Slovak Prime Minister at the time, I welcomed him before a packed Hviezdoslav Square in Bratislava. Wasn’t that a miracle? I mention these amazing stories of our recent common history not to cover up our defeats or failures. Neither do I mention them out of mere nostalgia: I do it especially for encouragement and as a source of inspiration and strength for future struggles and challenges we are facing today. I mention these great milestones of our history also to make us fully realize today, 100 years from the birth of Czechoslovakia, how forward-looking and right were Masaryk, Beneš, Kramář, Štefánik, Hlinka, Hodža and their contemporaries in their struggle to establish a Czechoslovak state. I will put it simply and directly: the birth of the Czechoslovak state was a blessing especially for us, the Slovaks. I’m neither a historian nor an ethnographer. I’m neither a sociologist nor an anthropologist. I am a runner. I thus dare to say that only a few nations had been able to run so fast on their historical path, to develop so dynamically, as we the Slovaks have been able to during the past 100 years. The pivotal role in this development has been played by our coexistence with the Czechs. Under both the Czechoslovak and the European roof. It is my great wish that we in Slovakia draw inspiration from this significant anniversary and take a step that should have been taken long ago and that must be taken: declare October 28 a state holiday also in the Slovak Republic! Dear friends, the founding fathers of the Czechoslovak statehood had a vision that inspired them in their struggle to achieve that statehood. They had faith in the values ​​on which that statehood was based. They had a plan on developing that statehood. They also had the will to implement their plan. And they had the moral qualities thanks to which they were ready to bring sacrifices for implementing their plan. Our history and our present bear witness to it. Our two nations live today in a united Europe. The euphoria over a major expansion of NATO and of the EU was followed by the shock of unprecedented global financial and economic crisis. Then in 2015 we were caught off-guard by a massive immigration wave. For the first time since its inception, the EU is losing one of its member states – the UK. The term ‘enlargement’ gave way to the term ‘Brexit’. Since 2001 we have faced large-scale international terrorism. Syria is suffering unparalleled hardships. A certain segment of the political elite in both the EU and in the United States questions the principles and perspectives of liberal democracy. Russia has annexed the Crimea, destabilized Donbass, and launched a misinformation propaganda war of global dimensions. Russia has set in motion a new Cold War. And, as if this were not enough, the cracks that no one would have expected started to appear in the relations between the staunchest allies, the EU and the US. No issue is therefore more topical or paramount today than the issue of the vision of the future of the transatlantic community. Naturally, interesting although not always positive things are happening also in Slovakia and in Czechia. But the decisive role for us in Slovakia and in the Czech Republic is and will be played by the European project and the project of the transatlantic alliance. Both sides, the EU and the US, have been taken off-guard by the developments of recent years. We are asking why do people turn away from the mainstream parties, why are populism, cynicism and egoism on the rise? It seems to me that the key problem lies in the failures of political elites of recent years. Instead of launching much needed reforms, political elites are increasingly resorting to making unrealistic promises. They do so because the reforms are almost always painful in the short run, while unrealistic promises bring immediate election gains. This is why we are witnessing the rise of the over-promising and under-delivering type of politics on both sides of the Atlantic. But people feel that it is becoming harder and harder to repay mortgages, that the real income, especially that of middle class and of young working families, fails to mirror the reported figures of global economic growth. The millennial generation shows more anxiety than optimism. And the parents of these young people are less and less confident that their children will succeed. If we add to this the fear of globalization and of rapid technological development, the fear of uncontrolled migration and the ‘unwavering’ political correctness of the mainstream media, then it might be possible to comprehend the phenomena of our times – populism, revolt and antiestablishment. A logical question thus arises: What is the way out? I don’t think the answer can be found in economic textbooks or in security manuals. Or in the introduction of new tariffs or in building protection fences around our countries. And it certainly cannot be found by relying on America to resolve all the problems of the world, while the rest us would either graciously allow it to do so in a better case, or criticize it for doing so in the worst case. In my opinion, the way out is to return to well-tested universal values ​​and ethics. Such return is needed in politics, the media, in public life as well as in family and personal life. The main challenge we are facing today in Europe is to restore unity within the EU, and to assume greater responsibility for not only our prosperity but also our security. The EU needs more mutual cooperation, but also more internal competition. The principle of subsidiarity in delegating and managing the competences should not be only declared but actually applied. It is necessary to limit the space of manoeuvre for those national leaders who often shift responsibility for their failures to European institutions. I believe that the time is ripe for meaningful European federalism. The United States could serve as an inspiring model for such project. Slovakia and the Czech Republic could seize a chance to become protagonists of such federal European model. We have our own experience with the so-called ‘federal arrangement’.This experience shows that a ‘federation’ built or imposed from top to bottom has only a limited chance of sustainability. But the construction of the EU goes in the opposite direction – from bottom to top. At the central level, member states should give the Union exclusive competences in four areas: foreign policy, security, common currency and the single market. All the remaining areas should remain under the competence of member states. The president of the EU should be elected by popular vote. The EU would thus be able to not only speak with one voice in foreign policy but, above all, it would be able to make quicker and more effective decisions. The EU has decided to move towards a European Defense Union. The work on this project must be significantly accelerated so as to make the EU assume more responsibility for its defense and security, especially in relation to its neighborhood (Russia, the Middle East, Africa. This project must not become an alternative to or be in competition with NATO. Just the opposite, it must be implemented as a stronger and more equal pillar of the transatlantic axis. It will have to include European engagement in the countries whose legitimate governments are unable to come to grips with terrorism, or which produce the waves of refugees because of their domestic turmoil. This project will contribute to improving the EU-US relations and to strengthening the transatlantic alliance. The transatlantic alliance has recently experienced problems for which not only we on the European side are to be blamed. The relationships between the Allies have been influenced also by a shift in the basic paradigm on the US side after the last presidential election. If the America First approach means protectionism, imposition of new tariffs on imported goods, retreat from the world outside – isolationism, then the shift has not been for the better. Yes, the EU must be ready to accept an increasingly wider responsibility for its own defense and protection. This cannot be doubted. On the other hand, I can understand the dissatisfaction of the American administration with the US trade balance figures. But this dissatisfaction must be addressed by mutual talks rather than by one-sided decisions. Taking unilateral decisions, retreating into one’s own shell, cutting off oneself from the world, especially from the EU, is not a sound policy from the geopolitical perspective, and neither is it sound as a matter of principle. Even such great and powerful country as the United States needs friends and allies. And, naturally, there can be no stronger and more trustworthy ally for the United States than the European Union. After the September 11 events I decided, as the then Slovak prime minister, to run the New York marathon. I perceived it as an expression of solidarity of Slovak people with the suffering your country went through on those days. On the eve of the marathon, I visited a fire station at Lower Manhattan. The firefighters of that station worked days and nights to recover what it was still possible to recover. There was a group of firefighters who have just completed their shift waiting for me at the station. I was greeted by a firefighter with Slovak roots and a Slovak name: Dennis Warchola. His brother Michael died while on duty helping the victims of the disaster and putting down the fire on Ground Zero. It was to be his last day in the service before retiring. These were truly emotional moments for me. A giant Slovak flag was spread out on the yard of the fire station. Inside the station, the furnishing was modest but very homey. I told the men that it made me feel the same way I felt at a different station – at my railway station. This was in a picturesque Slovak town of Kežmarok where I once served as Station Master. After I said that, one of the men, a big guy over six feet tall, started to speak. He said that in his entire life he never travelled outside the United States. What’s more, he had never been outside of New York City. During his whole life he believed that he did not need anybody outside of New York. He was convinced that he can rely on himself in everything. That his firefighter team and New York are all he needs. “How deeply I was mistaken, he told me. “We need your help, your solidarity. We are very grateful to you for coming. And for running for Michael and for the rest of us. September 11 changed this American’s perception of life. He realized the meaning and the power of friendship and of alliance. True friendship and alliance are not measured by money, tariffs, number of tanks or fighter aircraft. True friendship is measured by concrete actions and loyalty. In good times but especially in hard times. That was also the reason for me as the then Prime Minister to join the coalition of the willing and support the Allies’ military intervention against Iraq in 2003. That was also the reason why we sent Slovak troops to the area. We were not requesting evidence; we were not looking for weapons of mass destruction. We went there because the United States and the United Kingdom made a momentous decision. And we are their Allies. Ladies and Gentlemen, dear friends, we are remembering important anniversaries of Czechoslovak statehood as well as of the Slovak and the Czech statehood at a complicated time. At the time when the arsenal of nuclear weapons in the world is expanding rather than shrinking. Just as the number of frozen conflicts. At the time when many people are fleeing violence and are leaving their homes. When millions of people from Africa, Asia and Latin America want to get rid of poverty. And that’s why they are migrating. At the time when the climate change causes major catastrophes. When social media have ‘elevated the freedom to a fake news Eldorado. When the fourth industrial revolution threatens replacing human work by robots. When China wants to be a guarantor of not only free trade, but of global peace. When kleptocracy and arrogance of power in Russia not only destroy the country’s internal pluralism, but also generate new confrontations. Despite of all that I remain an optimist. I am an optimist because I believe in the power of human spirit and in goodness. Because I believe that where there is a will, there is a way. Because I have trust in universal values with the supreme value of freedom. And I also have trust in the ability of the West to prevail in the global competition. How true was a German friend of mine who said that neither China nor Russia can give their citizens what the West gives its citizens: freedom. The value of freedom lies also in that it allows competition. And competition is what moves individuals and society. Moves them to go forward, moves them to reach higher. Let me thus wish every success to the Slovak Republic, to our Czech brothers, to the EU and the United States, and to our transatlantic alliance! This entry was posted in Uncategorized by Richard Marko. Bookmark the permalink.